Watch the Weekly Spoilers Update! 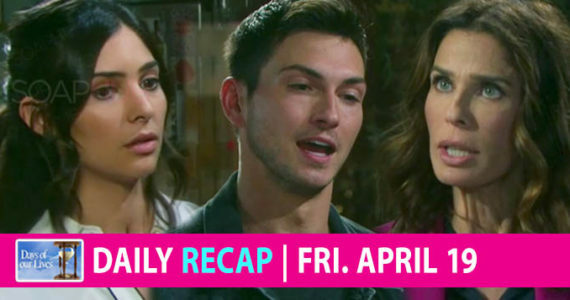 Your Days of Our Lives spoilers weekly for April 15-19, 2019, is here! Catch up on what you missed, get a sneak peek at what’s ahead, and see who won Soap Hub’s weekly cash prize! DAYS airs weekdays on NBC. Check your local listings for air times. We headed into uncharted territory on Days of Our Lives this week, and there were some surprises waiting for us! Rafe and Hope saw their romance finally come to its sad end, both because of baby David and the drama with Ted. Claire went through some stressful moments of her own, too, even going so far as to confess about the fire to Eve. Speaking of fires, Jennifer staged one of her own, hoping to win back Jack with her scripted rescue… but unfortunately, the entire event only sent the man more firmly into Eve’s arms. Suffice it to say that next week will see us in the very depths of the darkness. Here are the spoilers! Sensing that her last opportunity may be about to vanish, Claire crashes Tripp and Hayley’s wedding, ready to finally drop her bombshell. The heat starts rising elsewhere, too, as Gabi strengthens her attempts at seducing Stefan. A passion of a different sort will also erupt between Rex and Eric when their respective feelings for Sarah cause an explosion that could change the entire face of Salem. Continue to the next page for the cash basket winner reveal!